I received a copy of “The Great Shellfish Cookbook” from Appetite by Random House® for review purposes but was not otherwise compensated for writing this review. All opinions are 100% my own. Some of the links in this post lead to affiliate sites through which Earth, Food, and Fire may earn a small commission (at no increased cost to you) should you make a purchase. For more info check the Affiliate Disclaimer. Living on the East Coast of Canada, I am lucky to have fresh fish and shellfish available pretty much year round. It’s something that is easily taken for granted though,and not everyone has exposure to such a wide range of locally available seafood. This can make cooking shellfish (or other seafoods) at home seem daunting, when in reality, shellfish are one of the easiest foods to cook, ( in technical terms at least, but more on that in a minute!). Queue Chef Matt Dean Pettit and his wonderfully Canadian influenced, ‘The Great Shellfish Cookbook’. In his second cookbook, Chef Pettit introduces shellfish to the average home cook in such a way that it is, inviting, easy to prepare, and most importantly delicious. Covering everything from the more common types shellfish, such as crab, mussels, shrimp, and lobster, to some more uncommon, but no less delicious shellfish, such as octopus, sea urchin, and periwinkles. After a quick introduction where he discusses his love for cooking, and how this book and his latest business venture, (Matty’s Seafood Brands) came to be , Matt dives right in and teaches you some shellfish basics with an extensive Shellfish 101 section. These twelve pages (I did say it was extensive) are jam packed with quite literally everything you need to know in order to cook shellfish at home. Broken down by individual shellfish species, he covers everything from purchasing, storing, cleaning, and preparation methods. Along with a little background info and some fun-facts, this section of the cookbook is invaluable and will help you set your cooking apart from someone un-initiated in the ways of shellfish. 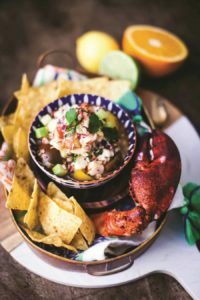 Lobster and Shrimp Ceviche – The Great Shellfish Cookbook | Photography copyright © 2018 Ksenija Hotic. What a list eh! Like I said, you’ll have shellfish coming out your ears! If at all possible I would recommend going down to your local fish monger, and making some friends, because lets face it, after seeing the fabulous looking pictures that accompany the recipes, you’ll want to try every single one of them! I know I sure do! 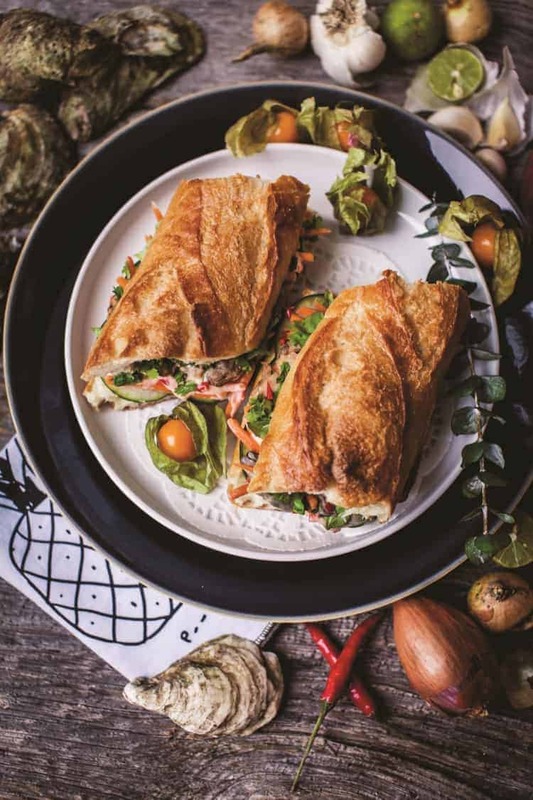 Fresh Oyster Banh Mi Sandwich – The Great Shellfish Cookbook | Photography copyright © 2018 Ksenija Hotic. The cookbook covers a variety of recipes for different occasions, though who’s to say you can’t have brunch for dinner! Each recipe is accompanied by symbols to help guide you through the various recipes. There are recipes for brunch, lunch, dinner, quick and easy recipes, pastry, and even a few contributed by celebrity chefs. Each recipe along with a small description and background, is described in detailed steps, ensuring an easy to follow method that anyone can follow, even if you did skip the Shellfish 101 at the start! Easy to read ingredient lists are displayed along side the method for easy reference. I’m a big fan of local comfort food, and was pleasantly surprised to see that PEI was specifically mentioned (Grilled Oysters, pg. 134). 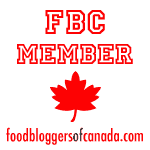 It was a nice remainder that the cookbook, puts an emphasis on local Canadian food, and most recipes actually mention various personal memories or experiences Matt has experienced around the country. b) dream of all the delicious shellfish I was going to cook up once I got home! I wanted to try out way to many recipes then I could talk about here in this book review, but I had to narrow it down. I wanted to pick two recipes that really showcased the books creativity, and the ease with which the recipes can be incorporated into anyone’s weekly life. The first recipe I tried where the Grilled Shrimp and Pineapple Skewers (pg,178). The perfect finger food, and a deliciously light meal to enjoy on a summers evening. While I wasn’t able to find raw wild shrimp with head and all, I settled for the next best thing. Large 16/20 shrimp from a local seafood supplier. The 16/20 refers to the number of shrimp per pound. In this case there are 16 to 20 shrimp per pound. I find these to be a decent size, easily skewered, and big enough that the skewers are filling. The recipe was easy to follow, with very clear and concise directions. I lacked the peanuts the recipe calls for and substituted parsley for cilantro,(my wife is not a fan of cilantro! ), but followed the rest of the recipe to the letter. While the skewering of the shrimp and pineapple can take abit of time, especially if making a large batch of this recipe, this task is easily made easier by preparing all your mise-en-place before hand. Make sure your pineapple is cut into chunks, the shrimp thawed(if it was frozen), and de-veined, and the wooden skewers soaked. 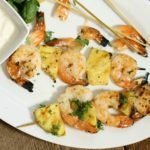 Slightly sweet and smokey, these grilled shrimp and pineapple skewers, make a great appetizer or light lunch recipe. Preheat the BBQ to 375F. Dampen some paper towels with the canola oil and rub the grill grate so no food sticks to it. Place one shrimp on a skewer, followed by a piece of pineapple. Repeat until you have three pieces each of shrimp and pineapple on a skewer, then make up the remaining skewers. Place the skewers on the grill and cook for 2 to 3 minutes per side. Remove them from the grill and wrap them in aluminum foil to keep them warm. In a small mixing bowl, combine the yogurt and agave nectar with the allspice and cinnamon. Mix well and transfer to a small serving dish. Serve the shrimp on a platter, garnished with lime quarters, crushed peanuts, and cilantro. Don't forget the dip! 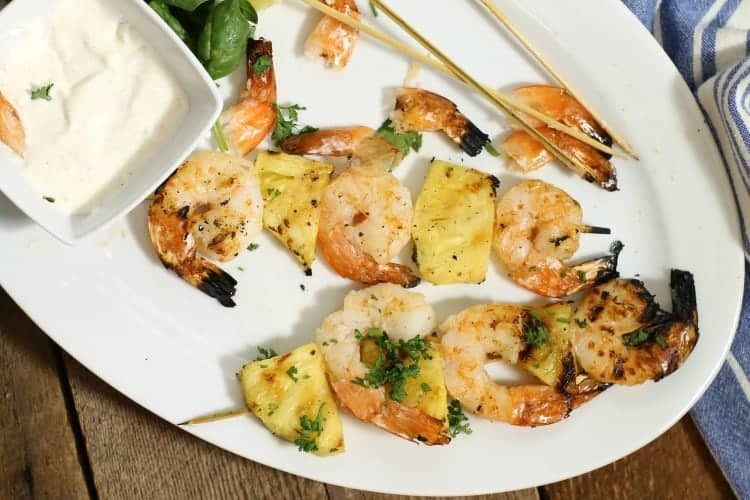 Ideal as a light summer lunch or dinner, these grilled shrimp and pineapple skewers will also make the perfect appetizer or addition to a buffet or backyard BBQ. 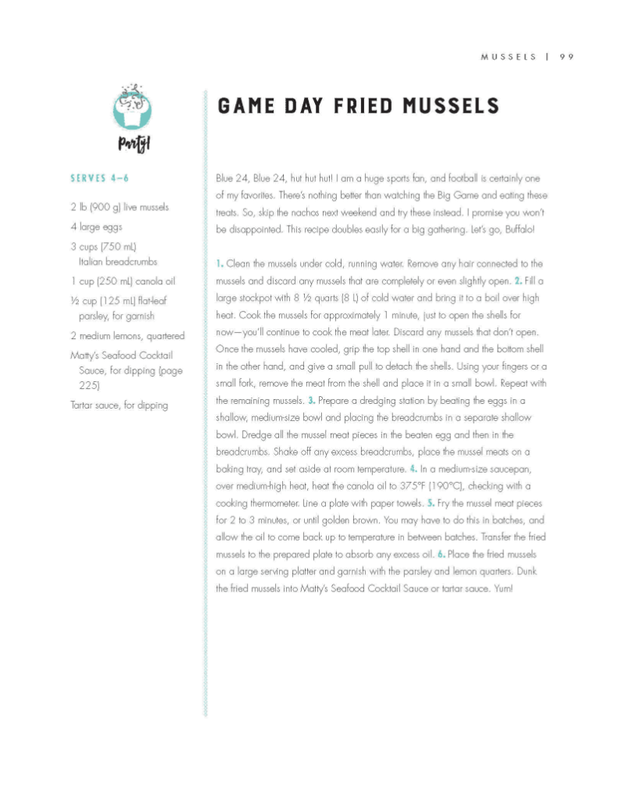 A recipe that immediately caught my attention while browsing through The Great Shellfish Cookbook, was Matt’s recipe for Game Day Fried Mussels. Working in restaurants I have spent my fair share of time battering various fish, and shellfish, but mussels has not been one of them. I’ve battered scallops, shrimp, crab, but never once considered making this super snack-able finger food! 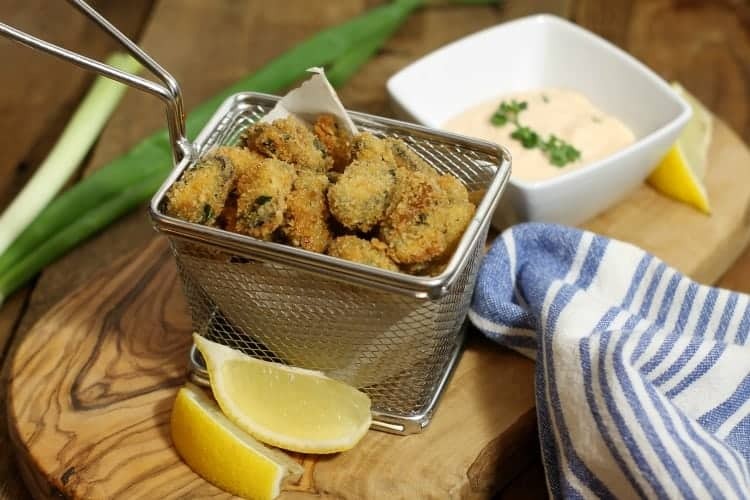 While these fried mussels are a little labor intensive, they are well worth the effort. I would recommend making a large batch of the recipe, and not doing any less then the four pounds as mentioned in the book. If you do less, it just doesn’t seem worth it as you will only get one or two handfuls of these tasty little mollusks. Of course doing a large batch is more time consuming as you’ll first have to wash and clean the mussels, and then cook and pick them, but enlist a friend or family member and this process will go pretty quick! 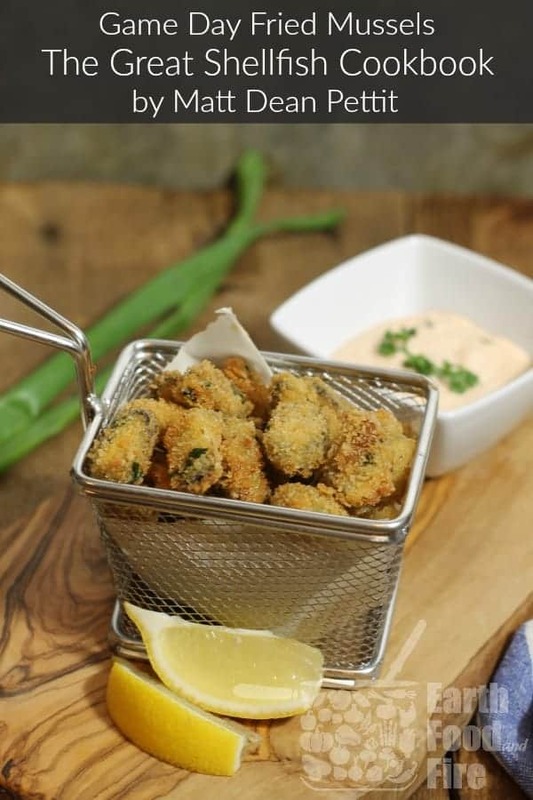 These fried mussels where so delicious, and surprisingly tender (despite being cooked twice), that even my two year old daughter absolutely loved them!! If you love shellfish or seafood of any kind, or simply want to learn how to cook shellfish better this is the book for you! Filled with creative and flavorful recipes that are easy to make, Chef Matt Dean Pettit provides a simple way for anyone to start eating more shell fish at home. I find I often get stuck in a rut, cooking the same things over and over. This beautifully designed cookbook, helps break that habit, and will challenge me to cook new and even some unusual recipe for my families supper rotation! Would I buy it? Absolutely! Everything sounds and looks so delicious. Thank you for lovely review. I’m a huge fan of seafood so I’ll be checking this book out. It’s a wonderful cookbook. I have since writing the review, tried more of the recipes, and they are so easy to make, and just taste fantastic! I love his grilled oysters! The recipes you’ve featured sound delicious and I am always collecting cookbooks, so thanks for the great review on this one! I’ll definitely be checking it out. Great post! It really is a great addition to any cooks bookshelf. As I mentioned in the review, the shellfish 101 sections is reason enough to buy it! I’ll admit that my exposure to shellfish has been limited to crab, lobster, and shrimp. Awesome to see a cookbook that could expand my reach and provide ways to go outside of my comfort zone! Give the book a try! the recipes are really easy to follow, and I’m sure you’ll be cooking shellfish like a pro in no time! There are all types of dishes you can make from that book. The very first recipe looks like ceviche and I love ceviche. I havn’t made ceviche in so long… I really need to do it again. Maybe another recipe for the blog! This looks like a great book for someone like me, who has a husband that is always asking me to make seafood! Loved your review! Would love to dig into this book for sure. I highly encourage you to check it out! It really is a great read even if you just want to learn more about different kinds of shellfish. This looks delicious, even if I’m not able to eat shellfish. I’ll definitely have to pass this along to my husband who loves shellfish. I’m sure it’ll be a hit with him! Thank you – this is a fantastc review! Shellfish is one of those areas that I wanted to pay more attention to and seems like a great starting point! Such a good review! My family loves seafood, although I’m not a fan of it myself, this looks like a great book to have in the kitchen! Love the addition of these aromatic spices into this recipe! This recipe looks really tasty. I love the aromatics of cinnamon and allspice in this! I bet your kitchen smells wonderful. It sure did! I hadn’t really thought of using cinnamon in a dip like this before, but it worked really well! That shrimp and pineapple skewer recipe is calling my name. I’m loving the variety of recipes in this book. It’s quite the range of recipes isn’t it!? Really something there for new and beginner cooks alike! This cookbook looks very interesting! I LOVE seafood and I was drooling over the photos of the fried mussels and the ceviche. Will definetly look into it. What a wonderful review Marcus! This books seems perfect for hubby and I’m taken by the gorgeous photography. The photography is absolutely beautiful I agree! I feel Like I have a lot of work to do to get to that stage! I’m really looking forward to the photography workshop Dennis Prescott is putting on for the FBC Roadtrip!